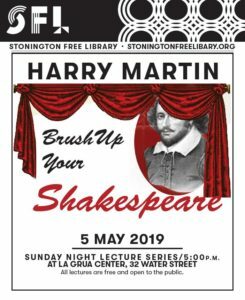 ​The La Grua Center, 32 Water St.
Harry Martin will discuss "Brush Up Your Shakespeare". This event is free and open to the public. Join us for a discussion of The Storyteller by Jodi Picoult. Coffee, tea, and cookies will be served. Warm weather has arrived, which means the ticks have as well. 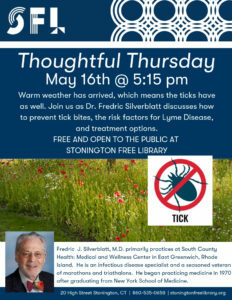 Join us as Dr. Fredrick Silverblatt discusses how to prevent tick bites, the risk factors for Lyme Disease, and treatment options. The Pawcatuck Neighborhood Center Book Group discusses The Widow of the South by Robert Hicks at the Pawcatuck Neighborhood Center. Amy Kurtz Lansing, Curator at Florence Griswold Museum, will discuss "Art and the New England Farm". This event is free and open to the public. Join us for a discussion of Educated by Tara Westover. Coffee, tea, and cookies will be served. Stuart Vyse will talk about his book "Going Broke: Why Americans Can't Hold On To Their Money". This event is free and open to the public. stJoin us for a discussion of Beach Music by Pat Conroy. Coffee, tea, and cookies will be served. Architect Joeb Moore will speak on "Trends in Architecture" at the La Grua Center. This event is free and open to the public. Joeb Moore is principal of Joeb Moore + Partners, Architects, an architecture and design firm in Greenwich, Connecticut. He is the recipient of more than fifty AIA New England, AIA CT, and AIA NY Design Awards since founding his practice in 1993. The firm’s work and process focus on the relationship between landscape, architecture, and art. Sarah Dove has been a private conservator of works of art on paper in Connecticut since 1991. Deborah Royce will speak about her new book Finding Mrs. Ford at the Library. Daniel Post Senning will speak on "What are Manners Today?". This event is free and open to the public. Daniel Post Senning is the great-great grandson of Emily Post and a co-author of Emily Post’s Etiquette, 19th edition and The Etiquette Advantage in Business, 3rd edition. He is also the author of Manners in a Digital World: Living Well Online. Mary T. Boatwright is a professor of classical studies at Duke University. She is a specialist in Roman history. Smeagull the Seagull teaches young children that animals are precious and have needs and feelings and family, just like us. There are few places on earth without seagulls, both on shore and inland, and every child will find Smeagull captivating and yet familiar. It is a good and moral story that will help jump-start the next generation of conservationists. The planet needs them! Smeagull needs them too. Peter Filkins will speak on his book "H. G. Adler: A Life in Many Worlds"
Howard Park will discuss his experience sailing around the world.